The new roof day was a great success. I am not worried about the next hurricane. My new roof will be able to withstand winds of 130 mph. There was damage--rot. Ugh! Extra costs, but they are repaired now. Although the roof looked good before they started--there was rot. Areas where the rood system had failed. Left unattended, more serious problems and expense would have resulted. What a beautiful day. The sun even shone for most of the operation. No rain. No crummy weather. I was worried whether the weather would hold, but it did. Roofs are just one of those things that I shouldn't have to worry about. And now I don't. It is hard not to be excited about getting a new roof. It is new, after all. It is something that the house has needed for a couple years now--I have been keeping the current roof in service through extra care. It really became a crisis during Hurricane Sandy, a/k/a/ Frankenstorm, when I was on the roof, accompanied at various times by Chris, Patrick, and Corey working to stem the leaking--successfully, I might add, during the worst part of the storm. I had the unique experience of driving when the roads were closed to secure roof patch at Home Depot and then climbing up the ladder to try to figure out where the water was coming inside form. Leaks never are where they appear! It is one of those facts of life. I was, however, successful in stemming the flow. And now, some four months hence and before the summer begins, the roof is being replaced. It is time to reset and restart the timer on my roof. The 22 year-old builders 20-year roof is at the end of its life. I have known this day was coming for some time as there are many new roofs in the neighborhood. I wish that I could take the rook money and do a nice vacation somewhere--but no, it will be reinvested into a roof. I do not believe new roofs increase the value of a home--they are one of those foundational requirements--roof? Yes. Does it leak? No. Nuff said! I'm not planning on being here when it expires the next time. I'm getting a lifetime roof--although I'm not sure whether that is my lifetime or the house. In either case, I should not be bothered by roof issues ever again. I will say, the process of getting quotes for this job was interesting. The variance between the low and high quotes was incredible. The last of the four company's didn't bother leaving a quote because they were going to be $2,000 above the lowest for lesser quality materials. I appreciated getting about an hour of my life back. Note to self--definitely get multiple quotes for big jobs! They should be arriving soon. I hope the weather holds. At least I'm taking a day off from work to watch/monitor the progress. It happened yesterday morning for the first time this year. I had to put my sunglasses on while driving to work--the sun was out and bright! I have been watching the sunrises for a number of weeks now, but finally, yesterday, the skies were clear and the sun was in my eyes. It was wonderful! Sadly, it is only temporary. Daylight savings time will soon return my morning commute to darkness until May when again I will be bathed in the glow of morning's dawn for a few months as I make my way to work. Maybe I should go into work later in order to enjoy the sunlit morning commute. But no, then I would get to enjoy less of the afternoon and evening which can be so productive and enjoyable. I already imagine sitting around the pool enjoying the warm evenings, swatting at the hordes of mosquitoes which desire to use me for their evening meal, enjoying the gathering golden light of the sunset only to dream of another dawn. The sunlight was a big change from the dreary darkness of last week. It makes the entire week seem full of promise and excitement. 1. Oscars! Now we know that Argo is the big winner. 2. It is amazing how warm 50 degrees seems after suffering through so many days in a row with highs in the 30's. 3. The Orioles have won their first two Spring Training games. Hope springs anew for another season! 4. How cool is it that the science community has found a missing continent. I wonder who misplaced it? 5. What is a Unicorn Apocalypse? "I want them to look like real unicorns. The way they look in real life." That, friends, is a television commercial. 6. I know that Springtime is near--the Daytona 500 was run yesterday. 7. I listened to a Spring Training baseball game on the radio! Sadly, by the seventh inning I didn't recognize many of the players. 8. By this time next week, the U.S. could be in its worst economic and budgetary crisis ever! Chris exclaimed this morning, "Stop, everyone, look outside. The sun is shining!" And so it was, or more correctly, is. The sky has a bluish hue to it and the bright orb that has taken its leave from us lately has returned. Amazingly, as I surveyed the yard I found that the daffodils are springing up in anticipation of warmer weather. They are really up and I expect to see some flowers during the course of the next few weeks. Even the cats are headed outside more. The temperature is above freezing and headed for near 50 today. I was joking that on Wednesday is the temperatures get above 50 degrees I may put the top down and drive Cat around--just because. With the sun shining, though, I know it is going to be a great day. Even more, because we will be celebrating Jax's fifth birthday. I am amazed how much the weather affects me. And, it seems, so are many people around me. This week was a good example. The weather was gray, and cold, and generally miserable. By the end of the week, so was I. Today is no better. Cold, overcast, and rainy. As this week wore on, tempers became short, skin became thin, and emotions began to run high. I came home from work last evening with a banging headache and feeling totally drained. I think everyone I know is ready for blue skies, sunshine, and mid-70's (or higher) temperatures. 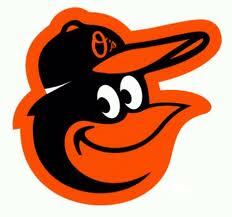 On the positive side, the Orioles are playing their first Spring Training game today! Summer cannot be far off. I looked at the forecast for Sarasota, Florida (where the Orioles hold Spring Training) and saw sunshine and 80 degree temperatures. I wish I was there. Right now! But, I am not. I have to take Makayla to get her nails done and accomplish a number of other tasks around the house today. All the while, looking at the cold, gray dampness which has descended upon everything. I did enjoy Ethan's last basketball game of the season already this morning. At least that means that youth baseball season is about to begin! The weather is a fact of life. It is just amazing how much it affects the quality of life. Does it matter that the Democrats want to break the back of the Republican Party, or that the Republicans want to embarrass the President? All Americans will suffer if our leaders cannot agree to govern and stop acting like spoiled children in the sand box. There are no parents to save the day and make the kids play nice. What happens if the meltdown is allowed to occur next Friday? - Our country will move from a bad reality TV show into disaster. - Our currency is devalued raising the costs of imports increasing the pain on consumers. - The price of gas sky rockets. - The prestige and honor of our great republic is forever tarnished. While these battles are not unlike those waged between Jefferson and Adams, at least our founding fathers retained the perspective that the country must survive. I am not so sure about our current leaders. It seems they are content to play a dangerous game of chicken. By the way--even if we dodge the sequestration bullet, the country still does not have a budget. It is a mess--no matter what rock we look under. The economic gains of the past two years are about to be lost because our dysfunctional government cannot agree on a budgetary way forward. The word is sequestration. It means the demise of the U.S. economy, defense, and livelihood for all. While to some it may sound like a good way to reduce the debt and the size of government--I will be a disaster because of the senseless cookie cutter approach that it will apply. If we think our government is bad now--just wait, we haven't seen anything yet. Most people have no idea how much they depend on the Federal Government for the livelihood they enjoy. And I do not mean just federal workers, who are the lowest of pawns in this embarrassing display of ineptitude. The U.S. is acting like a has-been third world nation. Both sides are playing brinkmanship politics with results that could cost far more than will ever be saved. No one is going to win in the end. So to quote a line from a movie: "The only winning move is not to play." I've been in a low spot. It could be the lack of sunshine, the continuing too cold weather, the pace at work, or my crummy racquetball outings--but nonetheless, I've been in a low spot. I played a racquetball match last evening and even though I had a lead late in both games, I knew I'd blow it, and I did. It was a self fulfilling prophecy. That written, I have come across a powerful song released last year by one of my favorite artists, Chris Tomlin. The song is Whom Shall I Fear? As I have been struggling against the cold darkness of the season and self-doubt, this song had lifted my spirit. It is a very uplifting song and I highly recommend it. Click on the link to YouTube above to see the words and hear the song. Perspective! That's what matters when I get too focused on the crummy seasonal weather, losing racquetball matches, being wrong more than I am right, or when I begin to doubt myself and my ability. I saw the sunrise yesterday grace the sky on my way to work. It was fabulous. The promise of the new day stretched out in front of me dragged me into the dawn of an exciting new day full of possibilities. I've got a lot of stuff to do every day and I need to take more enjoyment from the tasks completed than perseverating over the tasks remaining. Caution: This entry may be unsuitable until after the first cup of coffee in the morning. 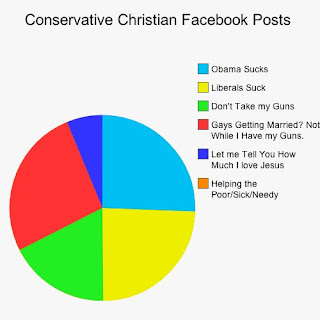 I ran across an interesting pie chart the other day which all to clearly highlights the image problems that Christians have today in America. I found it on Facebook originally and then this liberal site: Democratic Underground. Doing a Google search, I found it on many sites. I was shocked to see something so simple lay out a serious public perception problem so clearly. Christians in America today, and this is a broad generalization, are missing the boat on the truly important issues that they are uniquely gifted to undertake. While there is likely little science behind this chart, and I an pretty sure the entire thing was fabricated--Christians need to take note that the report card is not good. Reading the comments on the referenced site are very interesting and help to demonstrate that although it is important to be politically active and work to change the world, the way we are supposed to change the world is by one heart at a time. I was shocked that no measurable posts were devoted to helping the sick and needy. While I too believe that political activism is important, Christians need to be seen as more than just the radical side of the Republican Party--or Tea Party, or whatever. They need an identity separate from politics. It is clear that the current wave of political activism is overshadowing the important good that christians in America are doing every day. Christians are under attack--and many of them are painting big red bullseye targets on their backs to give the opposition more places to aim. 2. Maybe because I played hooky form church yesterday, but I was reflecting upon the meteors which fell in Russia and other places across the planet late last week and I ran through Matthew 24:29 in my head where it was written "the stars will fall from heaven, and the powers of heaven will be shaken." Just wondering. 3. Yesterday was the second successive week without football, but the hockey felt great with the Penguins winning a close game against the Sabers. Baseball is coming. 4. I was amused by the newspaper article about two brothers who won $75,000 in the lottery and then accidentally blew-up their house during the drug induced celebration. Certainly there has to be a better way to celebrate. 5. I saw the movie Escape from Planet Earth over the weekend. It is OK for kids. 6. I was shocked that the temperature outside my window was 19 degrees this morning. I thought I would be seeing warmer temperatures. 7. I bought a pasta maker last summer and I used it for the first time yesterday. It was fun and the pasta was grey--although there certainly was a lot of it. I am amazed that it took almost eight months before I took it out of the box and used the pasta maker. 8. I think I finally received my the last statements necessary to accomplish preparing my taxes on Saturday. Now I have to decide what week I want to be totally depressed about how much I am paying for the dysfunctional government that I am receiving. Caution: This is a religiously oriented entry suitable for Sunday reading. A couple of weeks ago I read about how the president of the Lutheran Church Missouri Synod (LCMS) had requested and received and apology from the LCMS pastor who jointly participated in the interfaith memorial service held in the aftermath of the tragedy in Newtown, Connecticut. I used to be a member of the LCMS--that does not make me an expert, but this episode does confirm some of the reasons that I chose to leave the fiercely conservative, almost to a fault, reclusive branch of Protestantism. "The Rev. Matthew C. Harrison, president of the Lutheran Church-Missouri Synod, had sought, and received, an apology from the Newtown pastor, the Rev. Rob Morris, for violating the denomination’s prohibition against joint worship with people of other faiths. But in the face of intense criticism, Mr. Harrison this week apologized himself. The problem is that the LCMS prohibits their pastors from participating in multi-faith public expressions of religion. They do not want to give the impression that there are many paths to salvation. Yet--while they may grasp a tactical situation, they miss the strategic--if no one is there to represent the path to salvation (and don't misunderstand, I'm not saying that the LCMS way is the one true way) then how are people supposed to hear the good news? My view? If Christians are withdrawing from the hurt and pain of the world when people need them most because we are worried about how it is going to look, then what good are we? Standing in the darkest places of life providing hope and encouragement to people filled with grief and sadness can never be wrong, can it? In my view, it is the difference between being on the front lines of the battle or hiding away in seclusion and advising others on what they are doing wrong. We get dirty doing work. The type of shenanigans represented by the LCMS in this case makes all Christians look petty. Springtime is Getting Close Because . . .
- The Orioles have started training in Sarasota and this year, unlike many other springtimes, there is a real sense of excitement about the prospects for this team based upon their success last year. - Football season has ended. - We were supposed to get two snow storms this week which produced rain with only a smattering of snow. - I feel a need to open the pool, even though my designated date is still 70 days away. - I've been looking at the pool supply catalog and planning the assault on my credit card to have everything in place for opening day. - We enjoyed two 50 degree days this past week. - I have my tickets to Orioles Opening Day. - Ash Wednesday is behind me and Easter in ahead. - The reservations have been made for summer vacation. While in Huntsville the other day, I was able to take a few moments out of my much too busy day to expand my mind by making my first ever visit to the Marshall Space Flight Center Space and Rocket Museum. I highly recommend a visit there for anyone fascinated by space flight and rockets. There is a revealing and interesting exhibit at the museum devoted to the Von Braun who really became the driving force behind the US space program in the years following his escape from the crumbling Nazi Germany at the end of World War II. Had he not made the decision to surrender to the American, he and many of his associates would have become Soviet scientists helping their space program. One of the items in the museum which caught my fancy was a rocket powered wagon that Von Braun experimented with as a child. "At the age of 12 he tried his first practical rocket experiment. He strapped six rockets to a small wagon, and lit them up. The wagon performed beyond his wildest dreams and careened about crazily, trailing a tail of fire like a comet. When the rockets finally burned out, ending their sparkling performance with a magnificent thunderclap, the wagon rolled majestically to a halt. The police, who arrived late for the beginning of his experiment, but in time for the grand finale, were unappreciative. They took young Wernher into custody. Fortunately, no one was injured and he was released to the Minister of Agriculture, his father. So began a career in rocketry that changed human history." I had to smile at the thought of the unmanned wagon wildly careening down the street powered by rockets. And then, I realized, that in today's America such a raw display of genius and creativity would be met with jail time and law suits. How different our society has become. ALthough I recognize that we no longer need to have children "kick the tires and light the fires" of their wagons to better understand how rockets work, I wonder where we a stifling that raw creativity with our stodgy, incredibly law oriented society. I will treasure the image of a boy watching his wagon shoot off down a street in early-20th century Germany powered by two home made rockets. Raw creativity and genius. Ok, so it is a bit trite and a manufactured holiday which has been overtaken by the greeting card industry to turn a profit. But like so many holidays, if we can get by the history and the homage to the saints of the catholic church named Valentine, there is a thread of good contained within as we remember, recognize, and honor those whom we love and admire. It is good also to consider and remember the history of the day and the stories of those who caused the day to be named for them. In this sense, the day has a history much like that of President's Day--which we celebrate on Monday, but which is really the fusion of two former holidays--Washington's and Lincoln's birthdays into a single day to honor the pPresidents of these United States. Give your love a kiss and say Happy Valentine's Day. It is good for the soul and probably the relationship. That the day has its roots commemorating a man who was martyred for marrying Christians is also nice to know. I had the opportunity to review three student projects for History Day at Chris's middle school. I was amazed at how the students were very focused upon war and battles as turning points in history to the exclusion of the geopolitical circumstances which caused the opposing sides to choose military action to resolve their disputes. Two of the projects were about the U.S. Revolution--and were reports focused on the Battles of Lexington and Concord. The other project that I reviewed was about the Vietnam Draft. I was amazed at the lack of context that the projects displayed. Taken outside of the historical context of the time, the battles seem to be turning points and yet--they are just battles in wars. I longed for a sense of completeness which would portray the battles as an extension of the conflicts which were occurring in the economic and political spheres of the time. Did the Intolerable Acts result the Battles of Lexington and Concord and are these battles truly turning points in history? Or, are the results of the conflict of the period to be found in our Bill of Rights? And also in our Constitution which became a template for many other similar constitutions around the world? Were these Battles turning points in history? I think not. They represented turning points of thought and helped to create a nation out of the Declaration of Independence. How was the Vietnam Draft a turning point in history? I'm not sure. Conscription has been around for centuries in many countries. Yes, it was bad. I had a lottery number. But the draft was not the turning point of the period, the entire ill-advised war in Vietnam was the turning point--and if a battle can be a turning point, it was perhaps the Tet Offensive which galvanized U.S. public opinion against the war. Terminating the draft would not have changed public perceptions of the war. I am a worried that our students are not being provided with a comprehensive, thought provoking history curriculum that stimulates thought and understanding by providing context and completeness. That written, I enjoyed my experience and the opportunity to interact with the students. I found them to be inquisitive and engaging. I look forward to doing it again next year. Sunday was a unique day. I did not watch any sporting events, or even part of a sporting event on television. There was no football--the Ravens won it all last week. I'm still in shock and awe over that outcome. I chose not to watch the Penguins lose a second game in two days to the Devils. And I stayed away from the Syracuse basketball game. These were the only games in which I had any interest. But, I took a sports hiatus in preparation for the resumption of my favorite sport: baseball. I actually got some of the small projects started and some others further along around the house. It was kind of surreal. I did make a trip to Home Depot after church. It was my second trip in two days for the all important "stuff. "And now there are a number of mid-winter projects underway. It was an in between Sunday. No sports and all work. I know that opening day for baseball is coming soon, I have my tickets in hand and am ready to go. Until then, I will dream of baseball, hot summer days, and a World Series ring. 1. Using the restroom during my flight from Anchorage last Friday, I noticed something truly weird.. There was an ashtray built into the door. I know I remember hearing something about it being a violation of federal law to smoke on an airplane. Why build an ashtray into the door? 2. My latest "crisis" is that the wine refrigerator has decided not to work. It is amazing how dependent I have become upon an appliance that I rarely consider. New parts are on order based upon internet troubleshooting. 3. I was reading the comments attached to an article about Federal Worker's pay and was appalled at the lack of understanding that some with vociferous opinions display about subject. 4. Watching the northeast prepare for the blizzard, I was happy not to be included in the fun. 5. Cold weather is preferable to snowy weather. Palm trees on the beach are the best, though. 6. It is February. Baseball Spring Training gets underway this week. Yay, I can almost smell the scent of opening day. 7. I saw a flock of Robins yesterday who have returned. Spring is closer than we think! Occasionally, while shopping, I run across items that make me smile. This sign caught my eye the other day and I can imagine many potential uses for it. 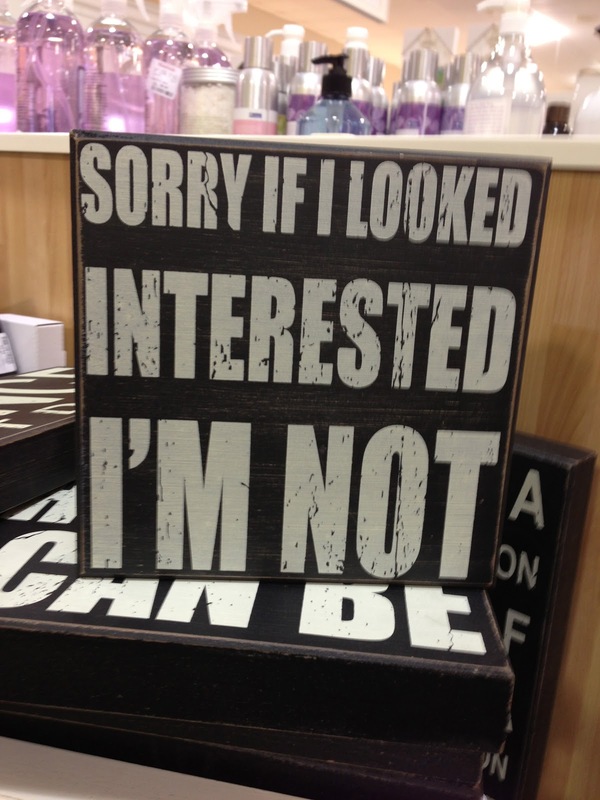 Think, for example, I could display this sign while waiting in a store and looking at display items to kill time instead of being accosted by the sales staff. Of course, it was a bit frustrating to be in Home Depot the other day and have three staff members ask me if I needed help--because I didn't. But it seems that when I need help, none are ever around. Think about displaying this sign when a conversation begins to run long because the other participant begins to include too much detail that is only peripherally related to the problem. Seriously, what's the purpose? 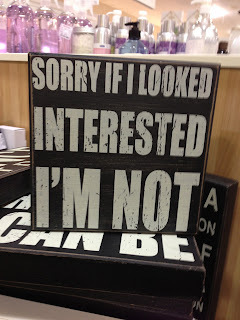 I did not buy the sign--because it could be considered insulting or in poor taste if I posted it in a work area. But, I still enjoy thinking about it potential uses. Before boarding my flight to Minneapolis form Anchorage, I was concerned about the family with two small children in the waiting area. The children were screamers. Not just your average run of the mill unhappy children, but first class, top of their lungs screamers. Their ability to create tension once on the plane was unsurpassed. The small children screamed so loud above the volume of the music in my earphones that often I could not hear the song. Who knew kids could scream with such intensity for so many hours. I was numb and trapped in the airplane at 39,000 feet. I don't know whether I felt worse for the parents or the other 200 plus passengers on the flight. And one kid was a toddler. It was a five hour flight. I actually was trying to determine how much hearing loss would occur if I turned up the Billy Joel music I was listening to in order to effectively mask the noise. The only one relaxing on the flight was Sweetie, the golden lab working dog seated behind me. She didn't seem to mind the noise. I couldn't even read my book or think of anything other than getting off the plane and hoping that they were not heading to Baltimore. Which, thankfully, they were not. I tried playing solitaire on my iPad, what a disaster, I couldn't even think about the cards. Maybe if the airline had offered free alcohol I could have overcome the noise. Or shared it with the parents. Suffice it to say, it was the longest five hour flight I have ever taken and those kids set a record for the number of hours they agitated over 200 other people who were trapped in the aircraft with them. On my flight from Anchorage to Minneapolis was a working dog named Sweetie. It has been a short five day trip, with two of the days being travel days. It is amazing how quickly the time has passed. Only one day, the first, was sunny and bright; at least for part of the day. And fortunately, I snapped a couple of images from the car just in case. Unfortunately, just in case came to pass and the remainder of my off time from work was snowy, too cold, and ofter dark. Those conditions just do not make the best combination for sightseeing. In fact, the most interesting thing that I believe I have seen are the heavy snow laden pine trees which approximate those in my Snow Village. Today is another long travel day. Ugh. Who knew that Alaska was so far away? 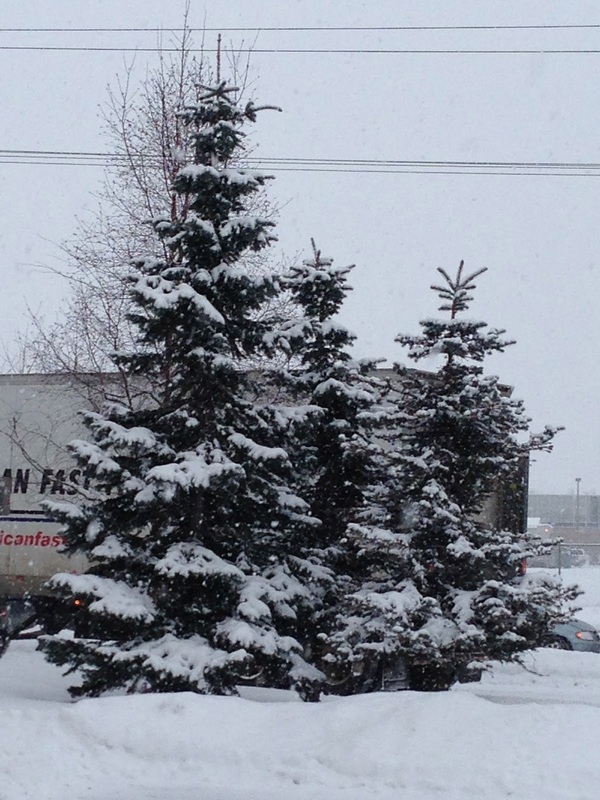 I had to take another image out of the hotel window, just to prove that there actually is daylight here in Anchorage. I wish my hotel had a better view, but, alas, it doesn't. It actually looks like almost any other winter, frozen, too far north city. I have found some scenery here. Yesterday, for instance, I saw snow flakes falling from the sky. Lots of them. About three inches of accumulation which would have been enough to shut down everything in Maryland. But no, what I saw was actually pretty amazing. Snow plows on the roads keeping the lanes clear. What a concept. And I saw drivers that were able to drive on the snow. From that perspective, it was encouraging to be reminded that snow does not have to create a regional shut down. Beauty is in the eye of the beholder. My eye was looking for palm trees and sandy beaches where I could hold a cold drink in my hand without getting frostbite. But, I did enjoy the way it clung to the pine trees making them appear like the trees I use in my annual Snow Village display. 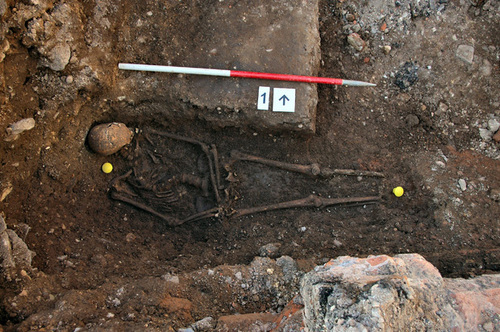 I have been fascinated with the discovery of the bones of the English King Richard III from the 1400's. Bones of the King who died in 1485, before Columbus discovered America, have been resting safely beneath a parking lot north of London. Which is why the probably still survive. The Washington Post article discusses the possible impacts of this discovery of the remains of the final monarch of the House of Planetagenet whose death ushered in the Tudors as monarchs of England. That I am so fascinated with this relic of history is not amazing. But that I am so intrigued by a king of England who was a tyrant and a warrior and depicted by Shakespeare as an evil, deformed, child murdering monster is a bit disturbing. I am looking forward to a future History Channel program about the search and subsequent discovery of the bones. The curved spine makes me cringe in pain every time I think about it--yet he was a King. I think back to life during the 1400's when the world was clearly flat and survival was a daily battle for most people. What a time. And why was he buried 90 miles north of London? I can scarcely imagine life during those times of upheaval. And like all despots and evil leaders--he died. Now his bones have been found and the stories can be confirmed or refuted. It reminds me of being in 11th grade history class and having to memorize all of the Kings and Queens of England--for no apparently good reason. How cool is it that science can confirm that these are the bones of that man. Wow! Well, it is not much to see, yet, given the early hour. I admit though, it was warmer in Anchorage than it was yesterday in Baltimore and about 15 degrees warmer than Minneapolis. It is still below freezing though, making it about 45 degrees to cold for my preference. As it has been dark the entire time I've been here, I really do not have a good sense of the landscape. Sunrise is not until 9:08 this morning. So it will be much later in the day before I can really take in the landscape. I'm not changing the clock on my computer, so this post will show Eastern Time--subtract 4 hours to find the real time of my post (about 6AM). The trip was long, but thankfully uneventful. I was lucky to have one of the two or three empty center seats next to me, so at least I did not get that sardine in a can feeling for the nearly six hour flight from Minneapolis to Anchorage. 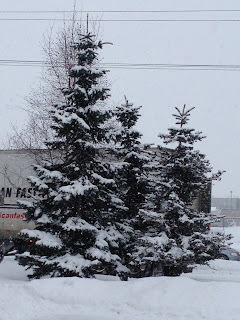 What excitement awaits me in Anchorage? Time will tell. It has been cold though, the streets are snow covered. In other news, the on/off switch on my bluetooth ear piece broke yesterday--so I have some shopping to do later today. Oh boy, new electronics! I have enjoyed watching the continuing coverage of the Ravens Super Bowl victory. There are some strange stories coming out of New Orleans, but I wish that I were in Baltimore for the victory parade today. When the Orioles win the World Series later this year, I will not miss the victory parade! 1. A football team from a working person's city, much to the chagrin of the NFL and all of the pundits, won one of the most exciting , nail-biting Super Bowl's that I have ever watched. The Ravens completed a dream season and played an exciting, sometimes ugly game in wining the Lombardi Trophy. Go Ravens!! 2. CBS's contract with the NFL should be immediately terminated until they get announcers who actually understand the game. 3. My vote for the best Super Bowl commercial goes to the Jeep ad. Second place goes to the Budweiser Clydesdale ad. 4. Wine tasting is the best way to spend an afternoon. Getting really into each wine and understanding the region and the grape to appreciate the color, the taste, the aromas, and the finish makes enjoying wine so much more than just drinking. 5. Super Bowls make for late nights. I didn't get to bed until almost midnight. And then I was up before 5 to play racquetball. 6. The power outage during the game is one of the most unique things that has ever happened during a Super Bowl. It changed the game significantly. 7. What else is there to talk about the day after your home city wins the Super Bowl? Well, the Orioles winning the World Series of course! One game--winner takes all and the loser is all but forgotten. I hardly remember the loser of last year's game--oh wait, it was the Patriots! The culmination of a season of hard work comes down to one game played on a huge stage where every defect and strength is on display. It is a game larger than life and larger than the sport, it seems. Even the halftime show is beyond belief. It is the only game all season where the television fans at home get to see the halftime show because it truly is a spectacle. The price for tickets is out of sight for the normal fan. This morning, I checked one site and the lowest ticket was $1194. Really? For a football game? And one that isn't usually up to the hype? Yet I know people who are there. My neighbors, for instance. I will watch the game--and as one might suspect I am all in for the Ravens, as I have been all season. I believe that although they may not be the better team on paper or in the computers, they have the intangibles! It is Ray Lewis' last ride. I suspect there will be a lot of purple in church this morning. But this is the day we have been waiting for since before the season began, so I need to enjoy it. 32 teams began the season with their sights set upon being in today's game--only two are left. At the end of the day, there will be a champion and an also ran. I watched a news report a few minutes ago about how a famous youthful star had signed a major contract with a diet drink maker. Read about it in the Huffington Post article. Seemed cool to me. The protectors of society, my name not theirs, have arrived on the scene to create controversy where there should be none denouncing the endorsement deal as irresponsible because of all of the bad health consequences associated with soft drinks--especially sweetened ones. Listening to the news report on the small minority of people who are on the front lines of this issue, I fear we are headed for a new prohibition era against soft drinks--which is really strange, where did I leave my glass of wine? But really? It is a diet drink! People drink soda, just like people still smoke, drink alcohol, and heaven-forbid use gasoline to power automobiles. I am more and more concerned that our society is becoming dominated by special interests which seek to impose their radical minority opinion upon the larger part of society often at the expense of reason and rational thought. Outlawing soft drinks--or large soft drinks as some cities have done or attempted, seems to be an abuse of power. Where do these abuses stop? We already have more laws and ordnances than I can even begin to comprehend. Condemning a star for inking a multi-million dollar deal to support a product which is legal and enjoyed by millions around the world seems extreme. We need to let parents parent, and we need to let adults suffer natural consequences of their actions. Let's stop creating controversy where there should be none and learn to live and respect others. I was sitting here, reading the morning news coming across the computer screen and mindlessly eating when I realized that two very deep, brown eyes were watching my moves closely as I came to the last corner of my breakfast toast. The last corner--of course, I do not own the last corner of my toast. No, it is Makayla's, and she knows it. It has become a morning ritual that I rarely notice, except when I am traveling or she is having an overnight in preparation for a trip upon which I have an early departure. She is patient. She sits there until the last corner is clearly available. And then, she inches closer. Sometimes she puts her nose on my leg to remind me that her piece of toast is nearly ready. I have to be careful with the jam though--too much and she gets is in her fur--and that causes other issues. When I am ready to share, she is so gentle about taking the corner of the toast from my hand. I have had other dogs who gulp the piece down without even really enjoying it, but Makayla seems to know that this special shared breakfast is a morsel to be savored and enjoyed. I think I enjoy giving it to her more than she enjoys eating it, but it does cement that special bond between us.